Discussion about this tutorial on Flickr. Please don't be shy, if you have comments or questions. 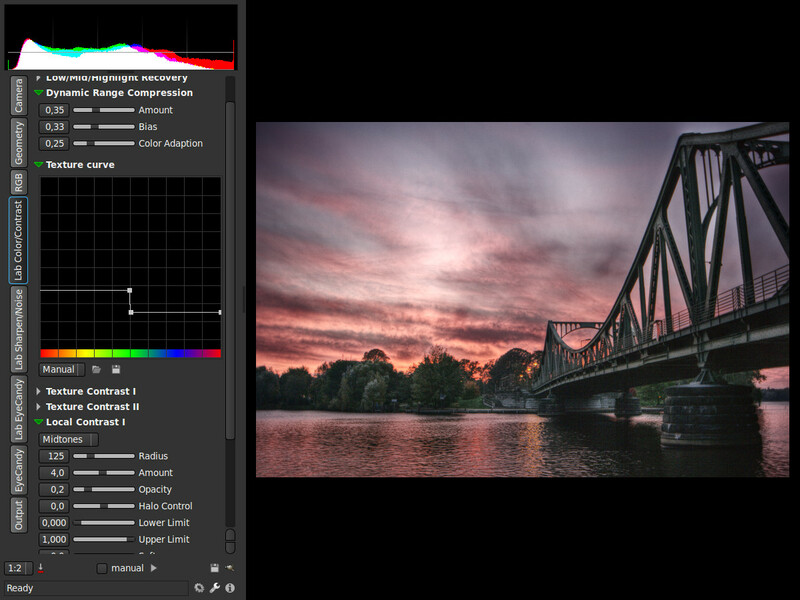 This is a short run through of how to get an HDR look from a single exposure. The tab previews are enabled by the small button next to the pipe size on the lower left. 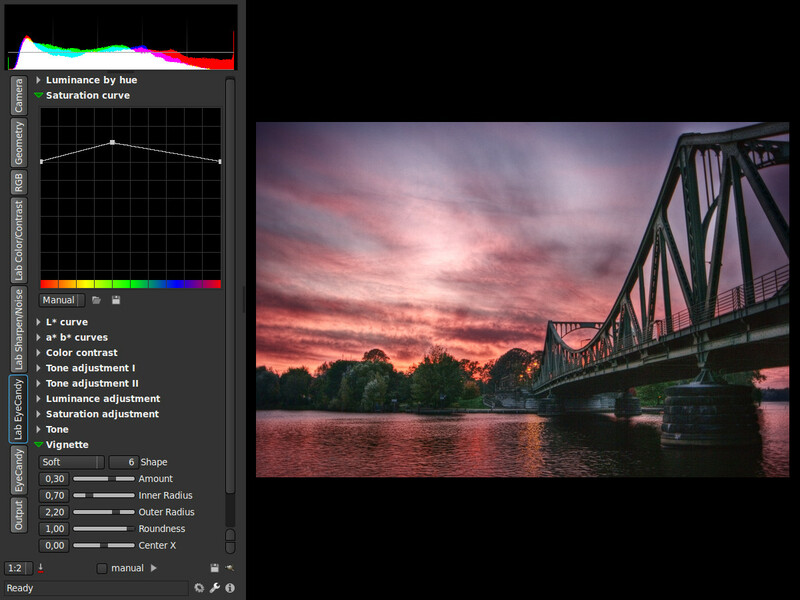 Of course, the quality you get from such a workflow cannot compete with a real HDR made of several exposures, but there may be situations where you just have forgotten your tripod or where moving parts don't allow a tripod. This stresses the image data quite a bit, so if you have a noisy camera you may get into troubles earlier. Basic exposure on RGB tab. 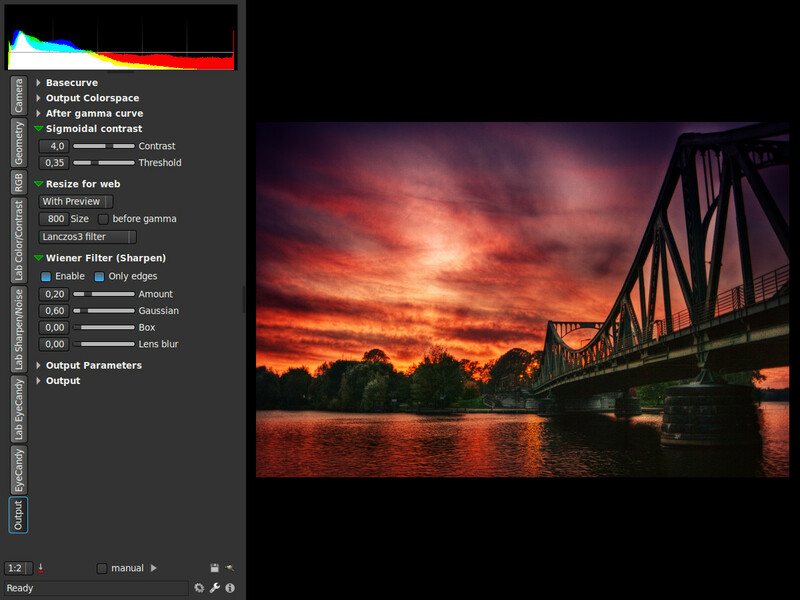 In this case done with the tone mapping algorithm Reinhard 05 which is behind Brighten. 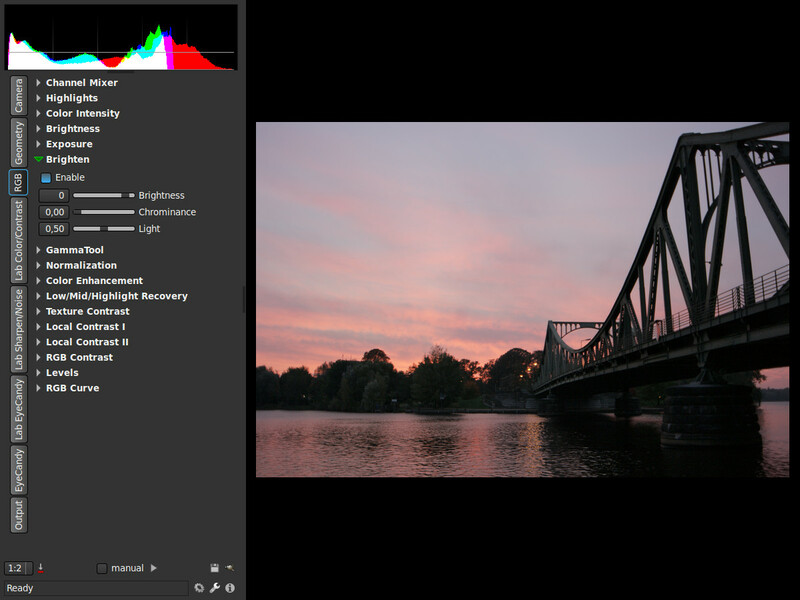 The goal is to use the whole range of the histogram. This is more or less where the magic happens. 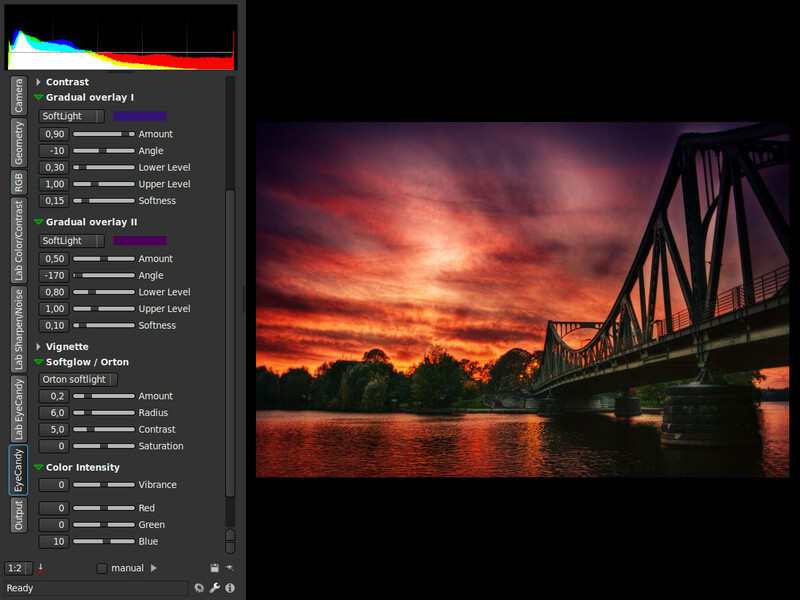 Dynamic range compression (also tone mapping, Fattal et al.) gets the values in a useable range and increases local contrast. A little texture increase in the warm tones and halo based local contrast with a larger radius to prevent small scale halos while increasing contrast further. Since we pulled up the shadows quite a bit, there is some noise. Here I filter only the color noise since the luminance noise is not so severe. A little halo based highpass sharpen for the details. 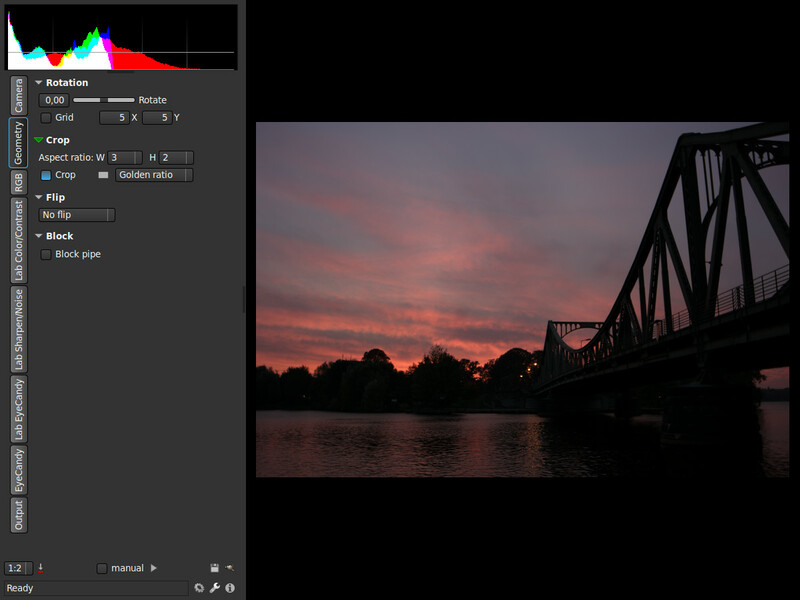 The contrast filters above work only on the L* channel so the saturation is untouched and this results in weak colors. Therefore all colors get more saturated now. The green tones get more saturation to get a color contrast to the red sky. A little vignette for more drama. This is now just colors stuff, I also toned the image which didn't fit in the screenshot. This is more or less all try and error till you get your desired result. I chose the weaker sigmoidal contrast here, to compensate for the sRGB gamma, instead of a base curve or the real compensation. 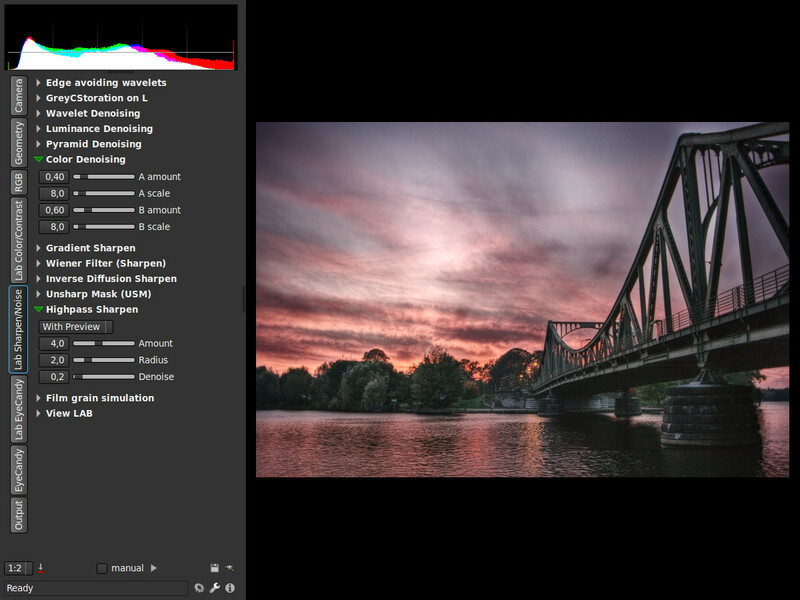 Downscaling and a little sharpening.